PANMUNJOM, Korea, Jan. 9 (Joint Press Corps-Yonhap) -- North Korea on Tuesday offered to send a high-level delegation and performing arts squads to next month's PyeongChang Winter Olympics, while the South proposed their athletes' joint entrance to the games' opening and closing ceremonies, Seoul officials said. 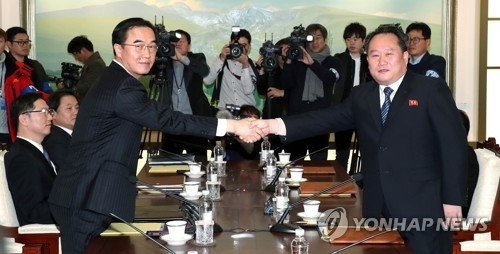 The two Koreas exchanged their proposals in the morning session of their first official talks in more than two years at the shared border village of Panmunjom to discuss the North's participation in the Winter Games and ways to improve ties. South Korea proposed the two sides march together during the opening and closing ceremonies and the North dispatch a cheering squad for the event, Vice Unification Minister Chun Hae-sung told a briefing. The South offered to hold a Red Cross meeting to discuss the reunion of families separated by the 1950-53 Korean War around the Lunar New Year's holiday in February. It also proposed to hold military talks to prevent accidental conflict along the border. "We also raised the need to end acts that can escalate tensions on the Korean Peninsula and to resume dialogue to bring peace to the Korean Peninsula, such as (North Korea's) denuclearization," Chun said. 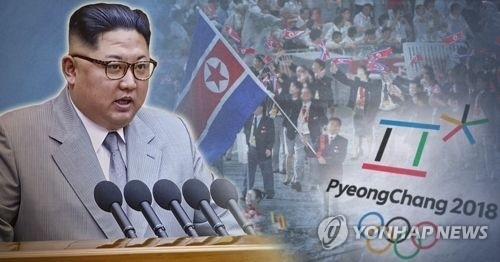 In return, North Korea said that it will send a delegation of high-ranking officials and others, including athletes, cheering and performing art squads, taekwondo demonstration teams and journalists, on the occasion of the Winter Games, he added. "North Korea proposed resolving issues regarding inter-Korean ties through dialogue and negotiations for peace and unity on the peninsula," Chun said. The meeting came after North Korean leader Kim Jong-un extended a rare rapprochement to Seoul in his New Year's Day message. He expressed a willingness to send a delegation to the PyeongChang Olympics and said the country is open for dialogue. North Korea accepted Seoul's dialogue offer Friday after the South and the United States agreed to postpone their military drills until after the Olympics. It also reopened a long-disconnected border hotline. "I came here with hopes that the two Koreas hold talks with a sincere and faithful attitude to give precious results to the Korean people who harbor high expectations for this meeting, as the first new year present," Ri Son-gwon, North Korea's chief delegate, said at the start of the talks. He is the chairman of the Committee for the Peaceful Reunification of the Country, North Korea's state agency handling affairs with the South. 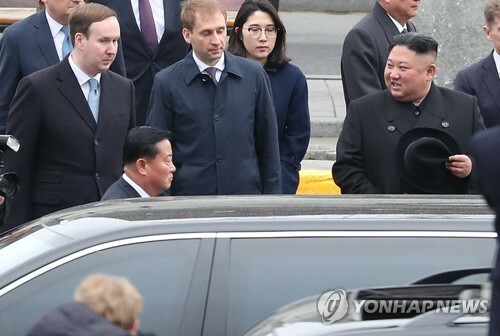 "These talks started after long-frayed inter-Korean ties," said Unification Minister Cho Myoung-gyon, the South's chief negotiator, in response. "Well begun is half done. I hope that (the two sides) could hold the talks with determination and persistence." The talks came as North Korea is under tough international sanctions over its nuclear and missile provocations. It conducted its sixth nuclear test and fired three intercontinental ballistic missiles (ICBMs) last year. The government of liberal President Moon Jae-in has voiced the hope that the North's participation in the games will help ease tensions on the divided peninsula that were sparked by the North's provocations. Moon also hopes that better inter-Korean relations will pave the way for the resolution of the North Korean nuclear issue and for broader dialogue between the United States and the North. Though the two Koreas will focus on Olympic cooperation, they are also expected to discuss ways to improve long-stalled inter-Korean ties. Possible agenda items with regard to the Olympics include whether the North's delegation would travel by land or other routes and whether the two Koreas would march together under a unified Korean flag at the opening and closing ceremonies. If the land route across the heavily guarded border is chosen, there should be consultation between the military authorities of the two Koreas. If the North sends a cheering squad or a performing arts and singing team, both sides will also have to consult over details such as travel route, accommodation and security issues. As to inter-Korean ties, Seoul highlighted the urgency of easing military tensions and resolving the issue of families separated by the 1950-53 Korean War by renewing its July peace proposal. In July last year, the South proposed holding military talks on easing border tensions and holding a Red Cross meeting to discuss the reunion of divided families. North Korea has not responded to Seoul's offer. North Korea may repeat its call for South Korea and the U.S. to halt their joint military drills, which Pyongyang has long denounced as a war rehearsal. The North could also demand that the South lift its economic sanctions and resume inter-Korean economic projects in exchange for its participation in the Winter Games, experts say. The South closed an inter-Korean industrial complex in the North's border city of Kaesong in 2016 and suspended a joint tour program at Mount Kumgang in 2008. North Korea "carefully" listened to Seoul's call for resuming talks for peace for the North's denuclearization, Chun said. "There were no specific comments (by the North) over international sanctions or the Kaesong complex," he added. Resumption of operations at the complex and of the tour project could spark a row over the possible violation of U.N. Security Council resolutions aimed at curbing the inflow of hard currency to the North. "The high-level talks can be called a success if North Korea agrees to join the Games and the two sides set the date for a next meeting and identify each other's stance over issues of mutual concern," said Yang Moo-jin, a professor at the University of North Korean Studies.